"Howlett's Mill was one of many mills located on the 13-mile long Saugus River, beginning at Lake Quannapowitt. The river passes through Wakefield, Lynnfield, Saugus and Lynn and was a vital part of the economy for centuries. The river, with its eight tributaries, was instrumental in fish harvesting and was the source of water power for the Saugus Iron Works, as well as many grist mills, chocolate mills, wool and flannel mills, and a tannery that were established aloing the river. The first saw mill in Wakefield was built by John Poole on the west side of Vernon Street. The mill site was later given to the town by Harriett Potter, along with the mill rights, in 1924." - Text from calendar by Jayne M. D'Donofrio. 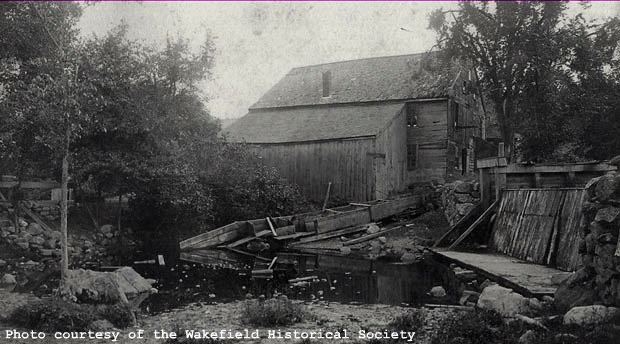 “Howlett's Mill, Wakefield/Saugus line, circa 1901,” NOBLE Digital Heritage, accessed April 20, 2019, https://digitalheritage.noblenet.org/noble/items/show/6986.